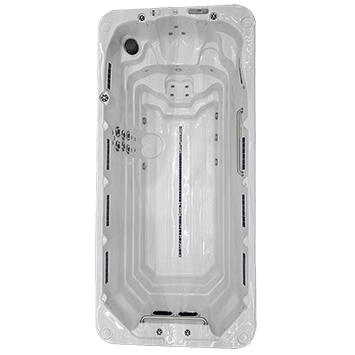 This beautifully crafted IQue Hot Tub is popular with both family and friends. Comfortably enjoyed up to 5 or 6 persons. Just sit back and let the soothing, bubbling customized massage work its magic on your body. Adding MICROSILK for Health and Beauty and you are really in heaven. Just imagine a clear cold winter evening, stars shining from the sky and the IQue Hot Tub enhanced lighting in combination with multiple waterfalls, you are now in Paradise. The Olympic 21 is the ultimate Swimspa that brings you the best of both worlds. The Olympic is the ultimate dual temperature swimspa. Nothing compares to this wonderful home aqua exercise pool and spa combination. 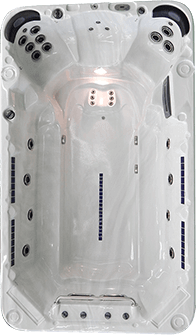 We took our most popular spa model (the Constellation Aquadynamic), added it to our bestselling swimspa and the Olympic was born. Fitted as standard with an unequalled list of features, the Olympic is the arguably the best swimspa available today. With LEDs in everything from the jets to the cup holders, 3 waterfalls, 10 fountains, dual controls and over 100 individual hydrotherapy jets, there is nothing missing from this incredible swim spa. New for 2017 the Olympic comes as standard with Bluetooth audio and subwoofer.